Even in his earlier career directing silly frat comedies like Road Trip and Old School, I always suspected that Todd Phillips has a much darker agenda deep down in his psychosis. Like with the rest of the world, I saw this come to the surface with the Hangover sequels, which got considerably nastier and more unpleasant with each passing follow-up, to a point where I couldn’t even tell if it was even supposed to be a comedy anymore, and if Phillips had just decided to make an overly dark and grubby thriller. Maybe his increasingly disturbing outlook on the world is better suited for a more straightforward thriller that has comedic elements, instead of the other way round, which is probably why I actually rather enjoyed War Dogs quite a bit. Grossly mis-sold as a Hangover-style fratboy comedy, it’s actually the fascinating story of two young men, David Packouz (Miles Teller) and Efraim Diveroli (Jonah Hill), who land a series of contracts that would help arm American forces in Afghanistan during the then-ongoing Iraq War, making millions in the process. Of course, this being the shady business of gun running, they inevitably run into all sorts of problems, from mismanagement of weapons stock due to unapologetic greed on Efraim’s part, to getting on the bad side of a rather scary American arms dealer (Bradley Cooper, who also produces). As a result, the film is more about how these young men try and avoid any real damage to their reputations, rather than offering a full commentary on the phoniness of the Bush-era response to terrorism. Either way, it’s fully engrossing material that Phillips is more than suited for. Watching this film, it struck me with just how many similar beats it was making to Pain and Gain, a film which if you are a consistent follower of this website you will know I absolutely hated (it would have been the #1 worst film of that year, but then Diana happened…). However, the key difference that I managed to differentiate between these two films is that this one is actually watchable; I really found myself interested in this story, and even these characters who by every definition are terrible people but never to an absurdly caricaturist point, whereas Pain and Gain was a movie made for steroid-drunk assholes with no redeeming qualities about its style, writing, direction, characters etc. With War Dogs, you absolutely know that what these two young men are doing is morally wrong and horrifically exploitative of a war that cost millions of soldiers their lives, but it’s told in such a way that manages to make you interested in just how they’re going to pull it off, because it actually calls them out on their despicable nature, especially Hill’s character who is an unholy combination of Eric Cartman and Tony Montana, and is exactly as monstrous as you may think. I think that Phillips finally managed to get hold of a story that allowed him to explore dark and depraved sides of humanity without having to make it a studio-pleasing comedy, and the results are far more appropriate than I could have ever imagined. Phillips perhaps doesn’t go quite go as dark as the story probably needs to be – for a film about gun runners, nobody is ever seen getting shot – but he still manages to stay in his element as he dives further into the warped psyche of its two leads, showing us what a crooked and greedy lifestyle they end up living by taking advantage of an international conflict. Intense stuff does happen, for instance there are dead bodies shown in abandoned gas stations, our leads are chased by Iraqi militants whilst they are driving through the Triangle of Death, and are even threatened at gunpoint by Cooper’s calmly terrifying arms dealer, and when it does Phillips makes the most of it, enabling it to be more compelling and even funnier than either of the two Hangover sequels combined. Hill, too, is especially good as the increasingly unhinged Efraim, who starts off as an obnoxious douchebag with an even more irritating laugh, and as the film goes on we get to know more and more about his darker side that’s just as dangerous as the weapons they’re dealing. We learn that Efraim is a genuinely talented manipulator, appealing to what certain people want to hear and creating an entirely fabricated persona based on that (which, in today’s political climate, is especially worrying to see mirrored on the big screen), and as he becomes more and more consumed by his own greed and aggressive nature, the more that Hill is able to take this character to new extreme heights, sometimes at the expense of poor Teller (who is also very good in this movie) who more often than not has to bear the brunt of his on-screen partner’s vicious behaviour. I don’t find it surprising that many are comparing this film to The Wolf of Wall Street, merely because Jonah Hill also plays a similar character in that film, but what I do find utterly fascinating is how much time and energy Hill puts into a role that he could easily perform in his sleep by this point. If you can’t get past the elaborate douchebaggery on display here, as is often with most of Todd Phillips’ work, then I can sympathise; but for me, War Dogs contained just the right amount to have me gripped and entertained all throughout. 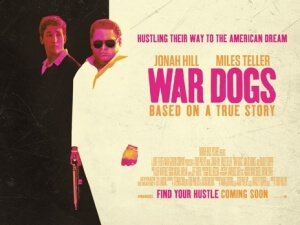 War Dogs sees Todd Phillips in his dark and warped element with this entertaining story of two young gun runners, whilst Jonah Hill gives a surprisingly compelling co-lead performance as the increasingly unhinged Efraim Diveroli.